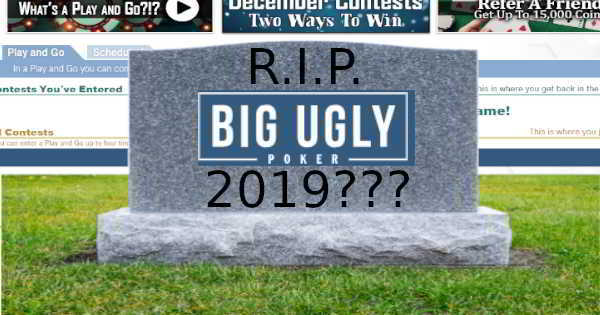 Big Ugly Poker: First 2019 Online Poker Failure? The free-to-play online poker site Big Ugly Poker appears to be defunct. There has been no communication from management since near the beginning of January, and the latest promotions shown on the website are from that same month. Customers of BUP hailed from all around the world, including the United States. 2018 had a high-profile failure of an internet poker room with the sudden February closure of Jao Poker, which shut down entirely, absconding with customers' funds. 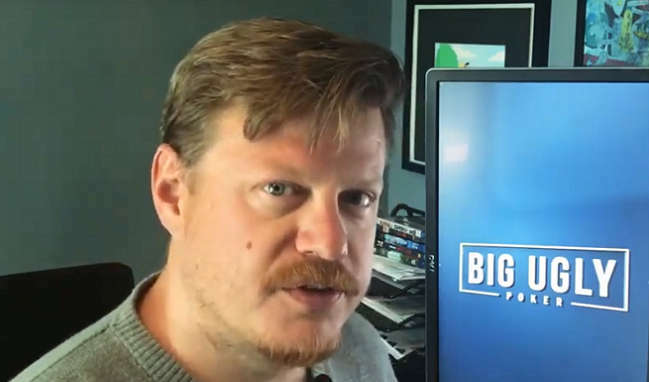 We're now in the first quarter of 2019, and it seems that the folks at Big Ugly Poker are threatening to mar this year's calendar of poker news with a similar scandal. It was in the beginning of February 2019 that players started to notice several signs that all was not right with the Big Ugly Poker room. The January promotion had not yet been paid out, and nobody had heard from the operators of the site since about a month prior. Shortly thereafter, the sponsored Big Ugly Poker forum was closed, and no messages or statements have been received from the poker room thereafter. Professional Rakeback has had contact with BUP three times in the past: before their launch, shortly after they opened for business, and a few months into their operation. We have been reaching out to the same contacts and email addresses since early February with no response at all. Big Ugly Poker funded its activities in a manner that's drastically different from the way most internet poker sites work. Rather than charging a rake, BUP derived revenue from ads shown to users at the tables. How Did These Ads Work? There was a timer that counted down at the top of the tables as customers played in the games. Once it hit 0, they had to watch an ad to continue playing. 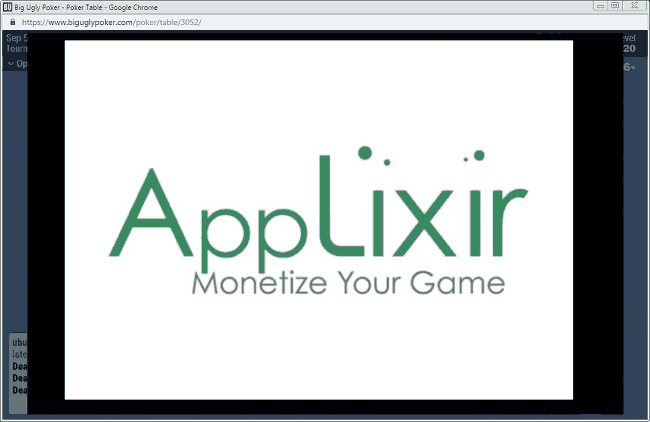 In order to prevent people from having an in-progress hand interrupted by an ad, the web-based software allowed users to load up an ad in advance before the timer expired. Big Ugly never ran cash games; only tournaments. These included both sit-n-gos as well as multi-table tournaments. The prize pool increased as more people viewed ads. The prizes up for grabs weren't directly tied to the number of entrants, but there was a correlation between the two because the more registrants in a given event, the greater the number of total ads shown to the field. All winnings were paid in an in-house currency known as coins. Once the Big Ugly Poker Store opened for business, these coins could be exchanged for PayPal and Amazon credits. Because of the unique structure of its games, BUP claimed not to be in violation of any gambling laws. There were no ring games on the platform, and the coins that users collected could not be risked on future tourneys. Both of these points were key aspects of the argument that Big Ugly Poker games were not a form of illegal gambling. Of course, we've seen all kinds of justifications and sneaky arguments used before to try to designate certain types of gameplay as not violating gambling statutes, most notably in the case of Global Poker. Most of these convoluted schemes wind up running afoul of the authorities. Besides the SNGs and MTTs that are common to almost every online poker provider, BUP also developed something called a “Play and Go.” This was a type of tournament wherein participants received additions to their stacks for every ad they watched. While the tourney was running, people could leave and re-enter, preserving their stacks while absent and continuing with their previous chip totals when they rejoined the event. Once a player amassed a minimum threshold of chips, they could end their Play and Go experience and cash out for a specified number of coins. Alternately, they could continue playing to try to reach a bigger prize payout before the event concluded. It was even possible to redeem a portion of one's chips while keeping the remainder in play. 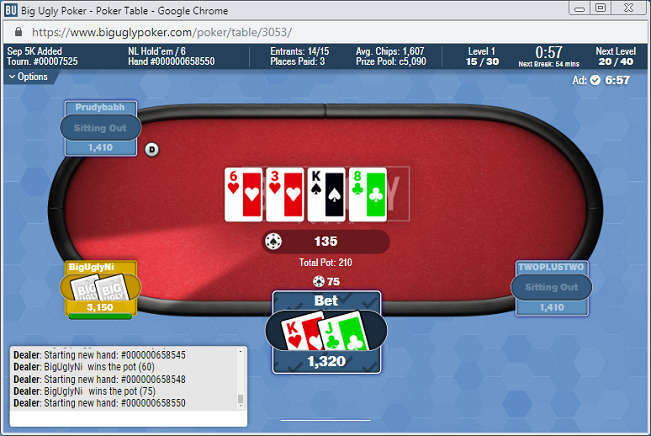 Some were initially wary of Big Ugly Poker when it launched in beta in May 2018 because of its unusual business model and the no-frills nature of its browser-only poker client. Many laid their doubts aside, though, when in July, the company opened up a sponsored forum at Twoplustwo, host of the largest poker-focused forums online. At first, users were winning chips without any way of exchanging them for anything of value, but this situation improved with the opening of the Big Ugly Poker Store at the beginning of October 2018. Many people subsequently turned in their chips for Amazon and PayPal funds, which were paid out in full. All appeared to be going well. These calm waters were to last only a few months though. Toward the end of the year, players started complaining of chip dumpers and multi-accounters who were consolidating their chips into the hands of a single account in order to achieve better placement on various leaderboard promotions. Then in February 2019, customers reported ever-lengthening payout timeframes. It was taking weeks to receive requested PayPal and Amazon funds: a process that used to take only a few days. Player concerns were met with silence from the people behind BUP. Forum representative “Big Ugly Greg” has not logged into his Twoplustwo account since Feb. 26, and his last post was made on Jan. 9. A look at the site's Facebook page reveals that it hasn't been updated since November 2018, and the most recent video added to the Big Ugly Poker YouTube channel was from October. Perhaps surprisingly, it's still possible to register a new account at the Big Ugly Poker website and play cards. Traffic seems to have declined substantially although we did witness 15 individuals playing in a tournament on March 25. Still, we don't really know how many unique users this represents as several people accused others in the chatbox of cheating by running multiple accounts in the event. Curiously, the home page states, “Chat with us at TwoPlusTwo.com,” despite the fact that there has been not a peep heard from the company's reps on Twoplustwo for more than two months. We wish everyone with chips in their accounts at Big Ugly Poker the best of luck in eventually being able to redeem them as was possible just a few short months ago. At the same time, we must acknowledge the reality that the future doesn't look too bright for BUP. We advise new players to avoid Big Ugly Poker like the plague unless and until the current problems with the site are satisfactorily resolved. If you're a U.S. poker fan who's searching for a place to play, check out our rundown of recommended USA offshore poker sites for a description of the most reputable operators that accept American customers. If you want to read up on other internet gambling enterprises that you should avoid, head over to our online gaming blacklist.